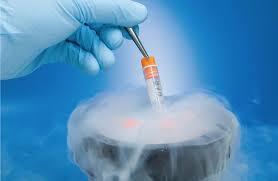 Dr.Malpani's Blog: When Freezing Embryos is a Bad Idea. In the past, the pregnancy rate with frozen embryos was poor, because a lot of these embryos would die as a result of the freezing and thawing process. The standard method was called slow freezing, and when the embryos were thawed, the ice crystals in the cytoplasm would kill the embryos. However, today, with flash freezing or vitrification, the survival rate is 100% in good clinics. However, the reality is that not all clinics are good clinics , and lots of them don't have the experience or the expertise to be able to vitrify embryos well. As a result of this, a lot of these frozen embryos get damaged during the thaw process. The trouble is that these labs don't share the truth with patients. They don't give them photos, so patients have no idea that the doctor is transferring damaged or dead embryos into them - embryos which have a 0% chance of implanting. Some labs do provide photos, but they doctor them , and patients aren't sophisticated enough to realize that the cells are dead or damaged. This is why so many of IVF patients start believing that freezing embryos just doesn't work . However, it does not work because the labs are bad - there's nothing wrong with the freezing technique ! That's why it's so important that you demand the clinic give you photos of your embryos, and that you do enough homework so you can make sense of them. No , you do not need to become an embryologist, but being a well-informed patient will help you get the best medical care from your IVF clinic, and maximise your chances of getting pregnant !